I like how there's no Archie only characters on Sonic's side, I really do. So far, I don't see Sally or the other Freedom Fighters, so it's safe to assume that this MegaMan/Sonic crossover comic will take place in the MegaMan Classic Games and Sonic Game Universe. Can't wait to see the team up of Sonic and MegaMan and the evil team up of Dr. Eggman and Dr. Wily. I love the fact no OCs are anywhere to be found on it. Silver being there I don't like though, but that's just me hating on 2006. Wait E-123 Omega? SO PUMPED. 3 MM1 Robot Masters, and then Airman... Possibly keeping things simple? I can see those 4 having the capabilities to stop Sonic. Surprised at the sight of no Quick Man though, would've loved to see him and Sonic go at it. Even normal releases are teased out four months or so in advance in the comics industry. Big things like these like this tend to be shown much earlier. Also Spaz does it again. Fukin amazing cover. And yet Quakewoman is in the background? *shrugs* Whatever, I actually like the original characters in the Megaman comic, I won't mind. Hmm... its funny to me that this is going to be a 12 issue arc spanning the three video game books (Megaman, Sonic The Hedgehog, Sonic Universe) because when this was first teased two weeks ago, the Sonic fans at the Knothole Village Forum predicted the exact thing. Of course, I had my doubts, but I understood how they got to that: Way back in the year 2000, Archie was going to do a 7 issue adaptation of Sonic Adventure 1 that would span the three books it had (Specifically 4 issues for Sonic, 2 for Knuckles, and 1 for Sonic Super Special). The big difference between then & now is right before it could happen, the Knuckles series (unfortunately or fortunately, depends on who you asks) had suffered low sales and was cancelled, which forced them to move the lineup to 6 Sonic issues and 1 Super Special. Well you have to keep in mind this story had to go through two companies maybe Capcom's ok with Archie characters and SEGA didn't want them in the story? The Sonic comic has been diminishing the significance of the SatAM characters rather thoroughly the last year so there might be some merit to that claim. Huh, in hindsight that does make sense. You mean it's going to be apart of the current MM issues, rather than be its own issue? ...I'm not looking forward to that. It just makes it seem like the crossover is canon to the MM comic. Hey, I like Sally Acorn. But then again, my only knowledge of her is in SatAM Sonic and Sonic Underground, so I don't have any idea what's happening in the Sonic comic. Still... SPAZ CAN REALLY MAKE AWESOMETASTIC ART! Dang! You must have skimmed the past press releases it'll be a twelve part mini series split amongst the Mega Man Comic, Sonic's Comic and Sonic's OTHER Comic (called Sonic Universe) for four months. i.e. you'll need to add two more comics to your pull list for four months. @Zerox-Sayoran: In the last couple of minutes, I've been trying to figure out how to summarize what's happened since the beginning, but I'll be lucky if you'll understand it so here goes. To start: Issue 50: Sonic defeats Robotnik when he's wiped out of existence. Issue 175: A parralel universe Robotnik (now called Eggman) burns Knothole Village to the ground, evening the score. Issue 200: Sonic soundly beats the tar out of Eggman, which turns him into Flame Hyenard for several issues. A new group of baddies takes over, causing Sonic & friends a lot of trouble before they eventually are defeated. Eggman ends up regaining his sanity and goes into hiding to build his ultimate creation. Sonic and Sally had a major breakup in 134 (which I'll spare you how it happens), but during Eggman's hiding, the two talk, make up and are a couple again. That's when Eggman launches his ultimate plan, Operation Clean Sweep, where he (literally) forces the world to reset into Genesis-era Sonic and then roboticize said world in one strike with his ultimate weapon, THE DEATH EGG MK.II Sonic & Sally try to stop the reset but can't and it looked like Sally was gunned down and died as the world reset, but after Sonic (in Genesis Era world) succeeds in undoing the reset he gets a few more seconds to save Sally from dying. Eggman proceeds to a backup plan involving roboticizing everything mechanical, causing them (and pretty much all buildings in Station Square from SA1) to blow up. Sally manages to sabotage the Roboticizer and make it blow up, but it ends up roboticizing her into Mecha Sally, much to Sonic's horror & Eggman's delight. Look's like Sonic's side will only be focusing on the game version, and that's still good! 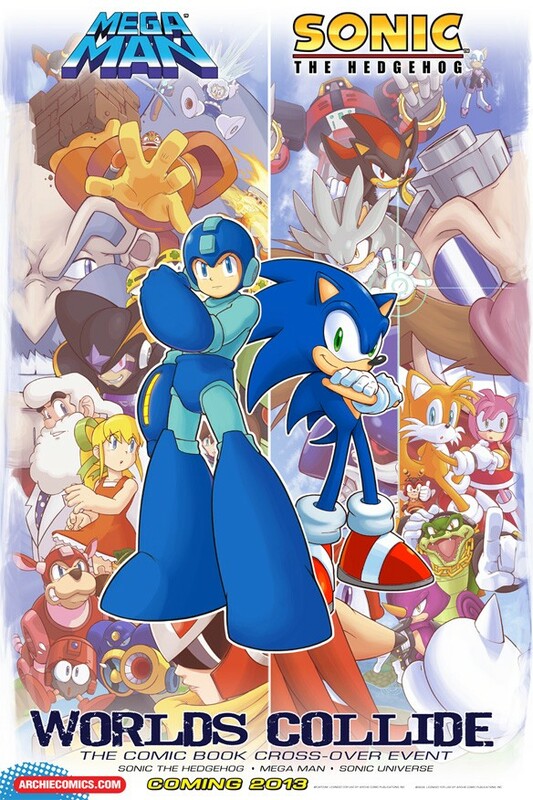 We wouldn't suggest any Archie characters to be in this crossover, since Mega Man too will be focusing on game versions too...but who's behind Mega Man? Is that Quake Woman? And Sniper Joe...looks like he's got something special too! Can't wait till next year! Who cares about "The world's gonna end" crap!? We're gonna get the comic anyways! @Rock-X: Whoa. That's a lot of history. Thanks, I feel up to date (of sorts) now! :D One last question: which part of the story did Flynn come in? @ZeroX_Sayoran:He came in at 160, but keep in mind that Penders stories didn't stop being published til later. I can only assume it was before or during "The Darkest Storm" 3-issue arc and I can't even confirm or deny that as fact either. In any case, Ian had the daunting task of resolving leftover plotlines from his predecessor. He may not have done it cleanly, but it was better than not resolving it at all. Also, speaking for myself on someone else's post, I didn't mind the Iron Dominion arc. Ian Flynn took over writing duties for the Sonic comic 6 years ago, and the book's quality improved immensely. You're a little bit late to the hating on Archie Sonic OCs party. This entire affair appeals to my inner child so much, you guys. Seriously, if I was 9 again, I'd be doing backflips around my backyard until this happened. whats funny is that this place is where i get all my megaman news, and sonic retro is where i get all my sonic news, and these stories showed up on both sites at the same time! Actually, I didn't say I hate the Archie OCs. I love them more than anyone else and wouldn't mind them to appear in the comic. That's just it. Anon 1 here. I'm actually someone who enjoys the comic, and agree the since Ian took the job, it got a lot better.